story by Emily Teel | photos by Albert Yee. Oley Valley Mushrooms is located just minutes from the Artisan Exchange and on Saturdays sets up shop at the indoor Artisan Market"She salvaged my sorbets,” says Marianne Cozzolino, owner of Jenny and Frank’s Artisan Gelato. “I was having texture problems and she said, ‘Why don’t you get a refractometer?’” Cozzolino’s savior, Brûlée Bakery owner Lila Colello, wasn’t lending her expertise as a consultant; she was just being a good neighbor. Independently, Colello and Cozzolino roll croissants and freeze sorbetto, but instead of taking turns in a rented commercial kitchen, they simultaneously work on their own equipment as members of a new entrepreneurial food community called the Artisan Exchange. The West Chester-based Artisan Exchange follows the co-working model first brought to Philadelphia in 2007 by Indy Hall, a member-oriented office space for designers, developers, writers, artists, educators and everyone in between. Since then, co-working spaces have popped up around the city. There is Seed Philly for techies and CultureWorks for creatives; the Artisan Exchange is for food makers. While members can take advantage of business support common to co-working spaces, like printing services and meeting rooms, the Exchange has the added benefits of commercial-grade kitchen space and a weekly Artisan Market for selling goods. Members have also discovered that the co-working community lends itself easily to logistical collaborations, allowing entrepreneurs to sidestep some of the production and distribution hurdles that can keep nascent food businesses from getting off the ground. Though rapidly diversifying, the warehouse that houses the Artisan Exchange and the weekly market was recently home to a single business: Golden Valley Coffee Roasters. Started in 1986 by John Sacharok, a former Wawa marketing director who developed their coffee program, Golden Valley largely deals with corporate clients. The company’s coffee is served in hotels, restaurants, convenience stores and gas stations throughout the U.S.
As global demand for coffee has grown, however, Sacharok noticed a disturbing trend. “Used to be you’d get a ‘Wow!’” but slowly, he says, “there wasn’t any wow left.” Coffee, a shade-loving understory plant, is now often sun-grown in a monoculture to produce more volume. Sacharok is adamant that this is “what is fundamentally wrong with the coffee business. The desire to drive down cost of production means that the product — flavor, antioxidants, aromatics — suffers.” Unwilling to compromise, Golden Valley changed course. John Sacharok, his sister Maryann Baldassare, her husband Frank Baldassare, and Joe Stratton, a Golden Valley Coffee Roasters employee and local farmer, opened the Artisan Exchange in June 2012 as a solution for Golden Valley's empty warehouse space.Sacharok and his business partner (and sister), Maryann Baldassarre, purchased roasting equipment. Frank Baldassarre, Jr., Maryann’s eldest son, became their master roaster. Today, the company still largely deals in the corporate world, but they roast their beans themselves and, whether it’s a priority for their clients or not, the coffee now boasts a sweeping set of credentials: Fair Trade, bird-friendly, and not one, but two organic certifications. They’ve even developed a single-serve coffee machine that brews single-serve cups without using wasteful pods, in order to continue marketing their product to offices and other companies rapidly switching to one-cup coffeemakers, like those made by Keurig. The shift left the business owners with a dilemma: a warehouse and central drive aisle larger than their current needs, but out of synch with warehousing trends. They were reluctant to sell the building in an unfavorable real estate climate. The team, which now included Frank Baldassarre, Sr. (Maryann’s husband and a former banking executive) and Joe Stratton (Golden Valley’s director of equipment services and a farmer), began to look for alternate ways of using the warehouse. “We were struggling to find a kitchen,” says Carrie Balthaser, “at $20 per hour it’s hard to get your product out at cost.” Balthaser, whose company Basic Batters makes gluten-free cookies, is one of the newest members. “I work in the corporate world, but this is my passion.” Golden Valley discovered that there was no shortage of passion among these potential entrepreneurs, but logistical concerns, such as space and licensing, were serious obstacles to making these businesses viable. The traits of their warehouse that were considered liabilities in the real estate market began to look like benefits. The central aisle meant that entrepreneurs could drive their vehicles in to unload supplies or load product for farmers markets. When the weather grew colder it also made the perfect enclosed place to host a Saturday market. 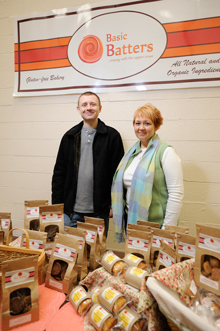 In June 2012, Golden Valley welcomed its first members to the Artisan Exchange. They envision it as an affordable home and a community for those seeking to transform their local food dreams into reality. Within the last few months, word has spread and interest has exploded. 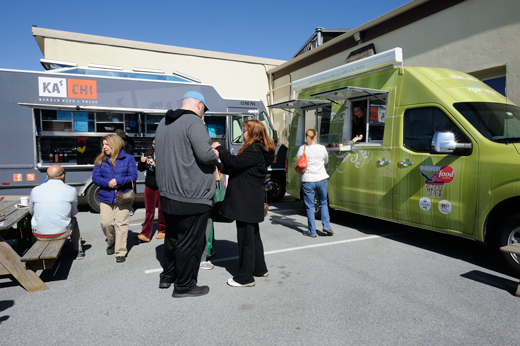 As of mid-March, members included 20 food businesses, among them two food trucks, Ka’Chi and LuLu’s Café, who use Artisan Exchange as a home base for their mobile businesses. Though plans for the space include the build-out of a commercial kitchen where aspiring entrepreneurs will work by the hour, the current model requires members to rent space in 120-square-foot blocks in three bays — called neighborhoods — of the warehouse. The U.S. Department of Agriculture and Pennsylvania Department of Agriculture have certified the entire space, and each neighborhood includes a sanitation station: the commercial kitchen’s trifecta of handwashing, prep and triple-basin sinks. Beyond that, members can equip their spaces however they like. Cozzolino had 220-volt wiring run to power her imported gelato maker, and Gary Crane of Gary’s Specialty Food Products installed a sink to wash peppers for his line of hot sauces. Some blocks are loaded with refrigerators of both commercial and Craigslist varieties; others stand mostly empty while entrepreneurs with day jobs, like Waffatopia’s Brian and Andrea Polizzi, amass equipment to build their businesses. Ka'Chi, a Korean food truck, and Dia Doce, a cupcake truck, also set up on Saturdays at the Artisan MarketIssa Ostrander, owner of MomPops and Take Me Bake Me Pizza, was among the first tenants. Ostrander is perhaps the ideal candidate for the new venture; as welcoming and gregarious as an RA in a dorm, he enthusiastically embodies the collaborative potential that the space hopes to foster. Having previously launched a retail food business — Mom’s Bake at Home in Manyaunk — Ostrander knows well the intimidation of starting from scratch. “[Here] you’re not coming into a brand new business alone … it’s more like ‘Welcome! Here’s a cake!’” And cake there is, alongside Sweet Salvation Truffles, and the many delicious gluten-free treats from Sally B Gluten Free, Rawsome Fudge and Basic Batters. Market patrons are enthused as well. West Chester residents Kate and her son John are exuberant. “We just bought our entire dinner!” they say, opening bags to show off purchases. “We had two boxes of macarons, but we ate one … mushrooms, chips and [guacamole], chicken sausage, pasta, gelato, and we’re about to go get coffee.” Even on a chilly March morning the market is pleasantly busy. The industrial space offers plenty of parking, shelter from the elements, and the real game-changer, Jackie, the Baldassarre’s 16-year-old daughter, who, along with friends, coordinates craft activities for children so their parents can shop unencumbered. So far, the vision set by Sacharok, Stratton and the Baldassarres seems to be playing out well. Entrepreneurs are interested, and creative relationships are forming. Before, Cozzolino threw away egg whites leftover from gelato production. Now, Colello uses them to make colorful, dainty French macarons. Lisa Ferraro Klinge of Taste Artisanal makes spreads with European cheeses that can end up on Ostrander’s pizzas or in Joe D’Andrea’s creative Vera Pasta. Antipasti platters are also in the works that will feature Klinge’s spreads alongside Cucina Verde’s local vegetable ferments and Maiale Salumeria’s cured meats. Chandler Brunnabenb and Carrie Balthaser's Basic Batters, a gluten-free cookie maker, is a newer member the Artisan ExchangeLogistical collaborations are developing as well. A group of members who sell their products at many of the same farmers markets plan to share transportation in the season ahead. They’re also discussing cooperative buying. Food distributors often require minimum orders of $2,000 or more. The plan, Ferraro Klinge says, is for members to “divide it up amongst cheese, chocolate, baking supplies or packing materials,” ultimately conserving their resources and avoiding excessive individual expense. Beyond saving costs, members have a tangible goodwill towards one another. The overwhelming opinion, which could easily skew competitive, is one of admiration, respect and conviviality. “The sense of community in here is just amazing,” Balthaser says. “We all do different things … but we try to complement each other.” Artisan Exchange continues to grow, accepting new members and building resources to include the commercial kitchen, an allergen room and shared cold storage. The hope is that the members’ respect for one another will keep pace with that growth and, like Golden Valley’s triple bottom line approach to coffee, the increasing demand will support an expanding community of passionate entrepreneurs.